Roland EGX-600 engraving machine has the torque, durability and quickness you can count on from a professional engraver. 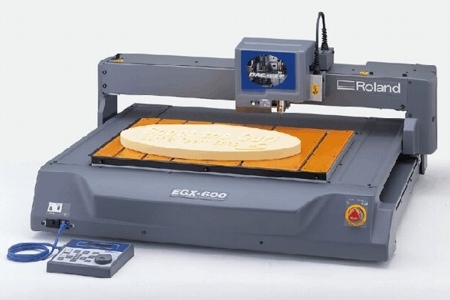 The Roland EGX-600 engraver easily engraves on an array of materials, including: brass, aluminum, urethane foam, wood, acrylic, and brass. The Roland EGX-600 engraving machine produces high quality indoor and ADA compliant signage in addition to promotional items, corporate crests and personalized items. Your ADA signage will reflect an upscale look as well as maintain all ADA signage guidelines. The Roland EGX-600 derives its impressive speed and quality from Feed Forward Processing (FFP) paired with servo motors. The servo motors produce exceptional levels of torque for smooth, quick engraving; while FFP (look ahead) technology is designed to anticipate the tool path ahead of time which results in more energy efficiency and greater accuracy. The unmatched speed, reliability and precision are a result of an industry-first combination of digital AC Servo (DAC) brushless motors on the X, Y and Z axis with FFP belt drives. In addition to faster cutting, the brushless DC motor and high-speed spindle produces less vibration while increasing torque. Roland EGX-600 engraving machine has an adjustable spindle speed from 8,000 to 30,000 RPM and an engraving speed of 100mm/sec. Features like these explain why more professionals choose the Roland EGX-600 over any other engraver. The Roland EGX-600 engraving machine does not require a computer present to operate. The Roland EGX-600 features a removable MMC memory card capable of storing files programmed on your computer which can then be inserted directly into the Roland EGX-600 for production without having a computer present. Create projects from virtually any computer and make them mobile for easy, quick production later. The Roland EGX-600 engraver also features a hand-held control panel that can be separated away from the machine allowing you to start and pause a job from a safe distance. 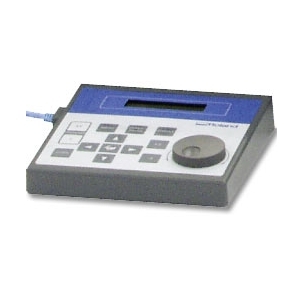 The hand-held control panel incorporates a jog dial for making menu changes or adjusting the spindle speed on the fly. Instead of using a computer, the additional teaching feature allows you to send operating commands directly from the control panel to the Roland EGX-600 engraver. Roland EGX-600 engraving machine features a generously large 24 x 16 work area capable of engraving multiple items at the same time. 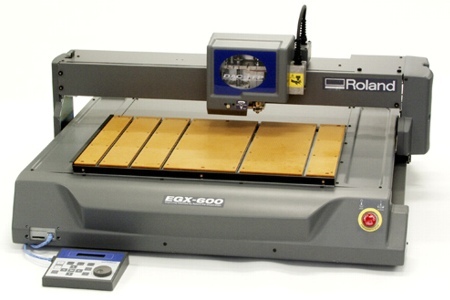 The Roland EGX-600 employs a gantry X-axis rail and flat table system designed to accommodate infinite lengths when engraving long boards for larger signs. The T-slot, Bakelite table can be removed easily when using vises, jigs or larger materials and can be surfaced for ultra-precise engraving. For fast and simple setup, an automatic surface detector determines Z-zero when the tip of the nose guard touches the material surface. To really boost up your production use Rolands sequence I/O controller and connect multiple Roland EGX-600 engravers together. Production line engraving has never been this easy. Roland EGX-600 engraving machine comes with a complete suite of bundled software at no extra cost. The Dr. Engrave software uses TrueType fonts and includes an automatic layout function for importing CSV database and Excel files. This is especially helpful when engraving variable data items such as nameplates and serial numbers. 3D Engrave software is designed to produce 3D reliefs along with MODELA Player CAM software, which reads STL and DXF files created with most 3D CAD programs. The Roland EGX-600 engraver also includes Virtual MODELA4 software which prevents unexpected surprises by simulating finished previews on your computer screen before production begins. MODELA4 can essentially help avoid errors which can end up saving you time and money. Its easy to see why the production engraving machine of choice is unquestionably the Roland EGX-600. The Roland EGX-600 is and unbelievable piece of equipment for my shop, This thing does everything, plus so much more ,and as far as the Tech Support , they are the best as well , they have walked me right through step by step , and Daniel Martinez has had plenty of patients dealing with me , Thanks for ALL your Help ! The Roland EGX-600 PRO Engraver has been a great tool and very reliable for our company. Great job. Ordered easily and will receive at appointed time.